The zoetrope is by far the best know of the "persistence of vision" toys. Invented in the early 19th century, the name is now applied to almost any drum shaped motion toy. 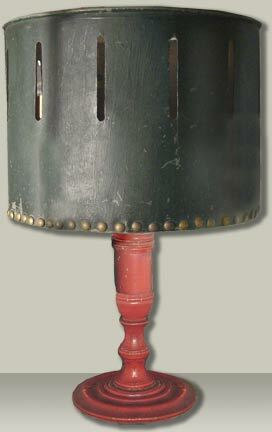 The zoetrope is a drum with a series of slits on the upper half. A strip with the same number of images is place in the lower half of the drum. When the drum spins the slits act as shutters to show the images one at a time. Each of the images shows a slightly different part of the movement and they blend into a smooth motion. On the left below is a large 19th century zoetrope on a red base. It holds strips as well as disk shaped cards that sit on the floor and give a second "movie". On the right below is one of our three record player motion toys. 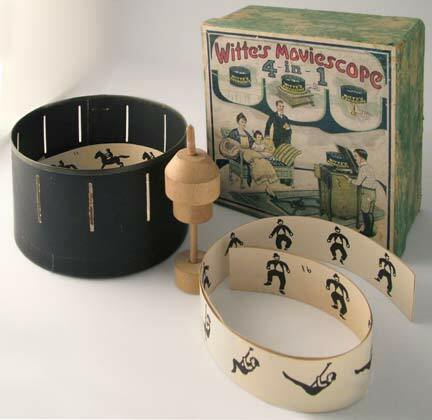 "The Whitte's Moviescope" is called "4 in 1" because it can be used in a number of ways. The wooden spindle can be used in several configurations so that it can be hand held or sit on the record player at different heights. The delightful graphic on the box shows a family enjoying the show. On the right is a 1905 supplement to the New York Sunday American and Journal newspaper. 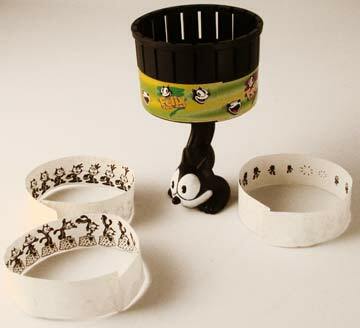 A zoetrope pattern with instructions and two strips are included. You can make your own by downloading a PDF of the page and sizing it to fit your printer. Enjoy! Today the zoetrope is available in several model kits. We have several different fast food toys like the 1996 Wendy's toy seen on the right.The base is a figural Felix the Cat and the strips are all of Felix. **NOTE** All items on the Collection of Collections web site are in our private collection and are NOT for sale. From time to time duplicate items from our collection will be offered for sale in the Do You Remember This? shop on the GoAntiques cyber mall. Visit the Do You Remember This? inventory page for photographica and toaster related collectibles. Please feel free to write us if you want to chat or share information about areas we collect but we will NOT give appraisals.